From time to time, readers reach out to me with topics or commentary that are important to them and that they feel our community of working mothers can benefit from. Because of this, I am encouraging our community to contribute to this blog/website — and the below is our first crack at doing just that. Children diabetes is something that we as parents should be concerned about. And our society as well. Times have changed since we were children ourselves. 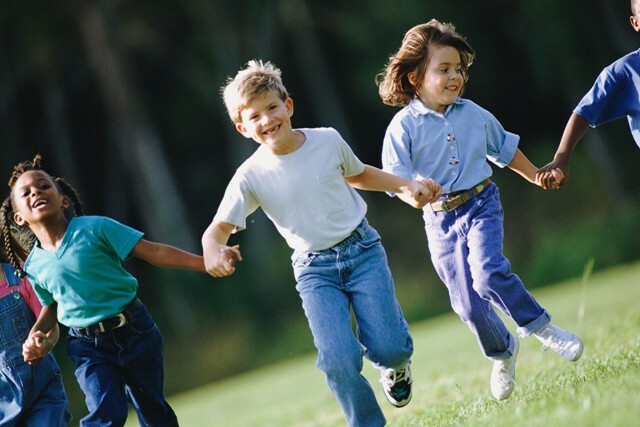 I remember as a kid playing and running outside like mad… swinging on swings and running and laughing with friends. But I also remember drinking powdered drinks that were probably loaded with sugar. And lots of “prepackaged” side dish in a pouch type things that were likely loaded with salt. I am wondering that as our society has made it easier for parents to quickly feed their kids, the choices that have been available to us have not had their health on the forefront. I can’t help but wonder if the dilemma of the working mother (shortage of time) has fueled unhealthy eating with our kids – sometimes convenience just trumps healthy because you have to get your hungry/cranky kids fed! Going through that drive thru at the fast food place sure does sound appealing. The prepackaged meals (even at my favorite, Trader Joes!!) sound good, fun, and fast but they are loaded with salt…. Adding to that is the change in physical activity for kids in general. Again, I was not a kid that grew up with “play dates” or organized activities. I was a kid that just played outside. I ran. I ran until my legs were bursting. I rode my bike relentlessly. On winter/rainy days I’m sure I was running around the house driving my mom batty. “Pong” on Atari or whatever the game was just wasn’t captivating enough for hours and hours of sitting. I just remember running. But now. Video games. Computers. DVRs and recordable TV. iPads. iPhones. These kids know how to use the mouse pad before they turn 2!!! Like adults, are kids retreating more indoors because of this…. So, when Carolyn approached me with the below article I was intrigued. She is not a working mother but the topic of children’s diabetes hits home for her. And she knows (albeit second-hand) what it is like for working parents. Sadly it is so hard to have it all… we are not Supermoms. We do not have endless resources of time available to us. So yes we need to do what we need to do. But, raising awareness of the problem may help you make different choices – and/or the below might help you with some ideas of healthy food options and also increasing the exercise levels with your kids – both critical as Carolyn describes below. Thank you Carolyn! Mamas…. what other thoughts do you have about healthy eating, exercise, or children’s diabetes in general? Last November was American Diabetes Month – normally this wouldn’t have had a personal impact on me. However, this year was much different because it just happened to also be the month that one of my young cousins was diagnosed with Type 2 Diabetes. I couldn’t believe that someone her age – 13 – could have Type 2 Diabetes, but after talking to the doctor and doing some research, I found out that children are actually the fastest-growing population for Type 2 Diabetes. Also, according to St. Joseph’s Cardiac Services, if left untreated, diabetes can lead to issues later in life such as heart disease, neurological problems, and even amputation. Since the two biggest factors in Type 2 Diabetes diagnosis is obesity – and therefore, an unhealthy diet and lack of physical activity – I decided to work with all of my cousins to get them on the right track for making healthy life choices. All of the changes we have made can be implemented by all families, which I have described below! One thing that all families can do together to become healthier is to make eating and being healthy a New Year’s resolution. One of the first steps we did was to incorporate a healthy diet plan into our lives. This seemed a bit overwhelming at first since my Aunt and Uncle both work outside of the home. Since we are a close-knit family, we came together to help them plan meals for my cousin – which not only benefited them in that they got extra help in planning and making healthier meals, but all of the parents (my aunts and uncles) were able to learn healthier tips as well that they could use in their own families. If there is no junk food in the house, no one will be tempted to eat it. If the entire family follows the same diet plan, there will be no foods in the home that are unhealthy or incredibly high in calories. Sticking to a diet and healthy nutrition plan will be a lot easier for all of you so that it is not as big of an issue. I’ve noticed with the rest of my cousins that this has helped them to stay healthier and lose some weight as well. cut out sugary and salty sweets for healthier, creative snacks. **note: this may seem time-consuming, but these are the types of things we like to do when we get together as a family, so it helps my Aunt by having more hands to help prepare them! Getting regular physical activity is very important. Create an exercise plan that you all can enjoy on a regular basis. Just because the word exercise is used, that doesn’t necessarily just mean going for a run or to the gym. Get creative! For example, you might want to make it a habit as a family to take walks around the block after dinner when the weather permits. You might even want to play video games that encourage physical movement so that you really have fun together (my cousins like to use Wii Fit and play Dance Revolution). Again, my Aunt and Uncle work full-time, which can make this somewhat of a challenge each night. I am nearby so many nights I will come over and make sure to do an activity with the kids. When I was growing up, both of my parents worked full-time but they were adamant about us kids staying active and healthy. They used to let us play outside for hours before it got dark out, and we learned to like playing outside and being active instead of being inside for all hours of the night. Also, getting kids from the neighborhood together to play games outside allows the kids to get exercise without the parents having to always be with them. Exercise can help to bond your family and aid in weight loss for those who are struggling with their weight. Getting healthy can be very difficult, but it’s important to get healthy as a family so that it is easier for you all to do. You might even find that your family exercise nights are a lot of fun and are something that you actually look forward to. The key to establishing a diet routine and exercise program for your family is to make plans and to create a schedule that will work with everyone in the family. Even though you all live busy lives, this does not mean that you should give up on your health and avoid losing weight.